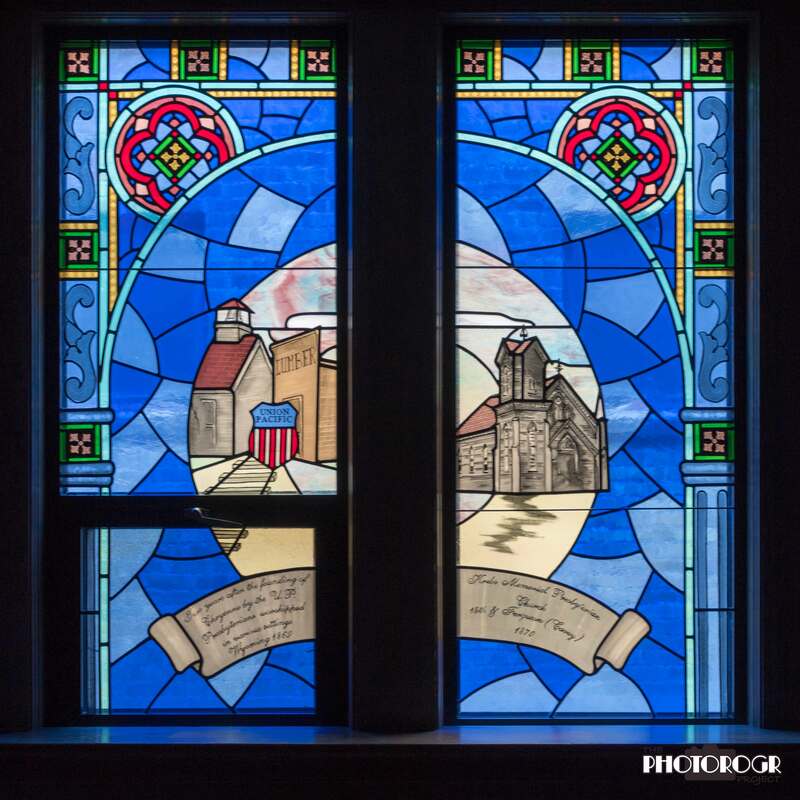 Today’s featured windows are located on the main floor of the Sanctuary, along the north wall. There are 4 small alcoves at the back of the Sanctuary. While I can’t say for certain, they were likely used as small group meeting or Sunday School rooms, but could handle overflow seating for the Sanctuary. 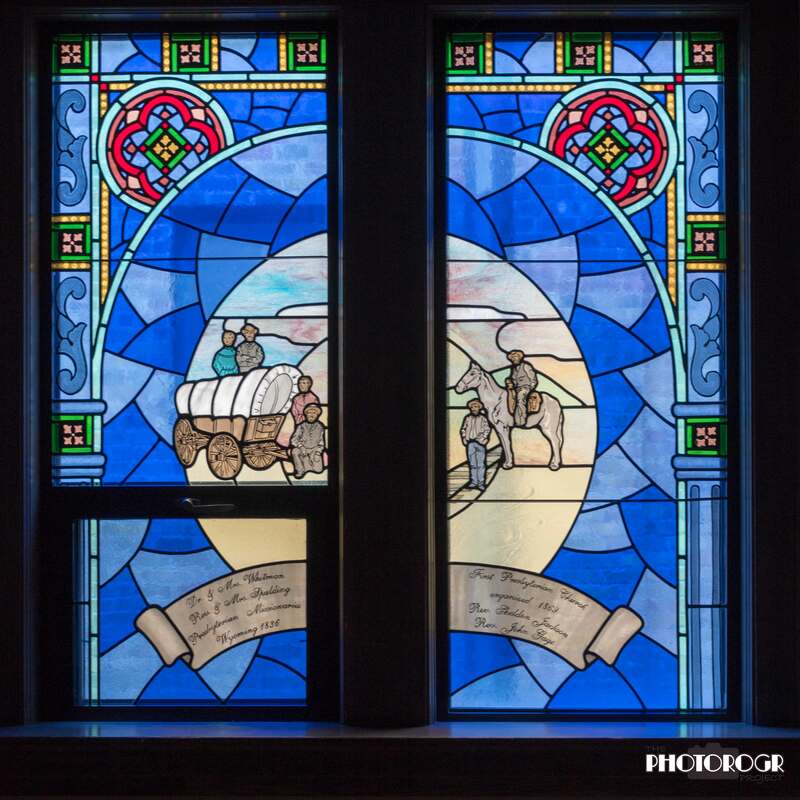 These windows were dedicated in May 2003, and tell a story of Presbyterians in Wyoming and Cheyenne. The panel on the left depicts Dr. and Mrs. Marcus Whitman and the Reverend and Mrs. Henry H. Spalding, Presbyterian missionaries who traveled through Wyoming in 1836 on their way to establish a mission near present-day Walla Walla WA. Mrs. Spalding and Mrs. Whitman are recognized as the first American women to cross the Rocky Mountains and reach Oregon by the overland route. The panel on the right shows Presbyterian missionaries Reverend Sheldon Jackson and Reverence John Gage, who formally organized the First Presbyterian Church in Cheyenne in 1869. Nine men and women signed the organizing petition. Prior to constructing their first house of worship, the Presbyterian congregation met in a school house and the office of a lumber yard. The first church building (right panel) was built in 1870 on land donated by the Union Pacific Railroad located at 18th Street and Ferguson (now Carey Avenue). The prefabricated building was shipped to Cheyenne via the UPRR. The Rutgers Church of New York City donated $7,000 for this building, Apparently a member of that church had a son living in Cheyenne and wanted him to have a Presbyterian Church to attend. The third window (left panel) shows the second church building, built in 1884 and located at the 18th and Ferguson site, and was known as the ‘Red Brick Church.’ The clock on the tower of this building was a painted facsimile. The hands always pointed to 11:20, the hour and minute when Abraham Lincoln was shot. The right panel shows the Wyoming State Capitol building, built in 1888. Wyoming became a state in 1890, the 44th state in the union. The Reverend Dr. John Y. Cowhick, pastor of the First Presbyterian Church, gave the invocation. Church member and women’s rights activist Theresa Jenkins gave the first speech. (Note that Wyoming was the first state to give women the right to vote, earning the nickname ‘The Equality State.’) Church member Moses P. Keefe was given the contract for the first set of east and west wing additions on the Capitol Building, completed in April 1890. Church member William R. Dubois designed a second set of wings, completed in 1917. 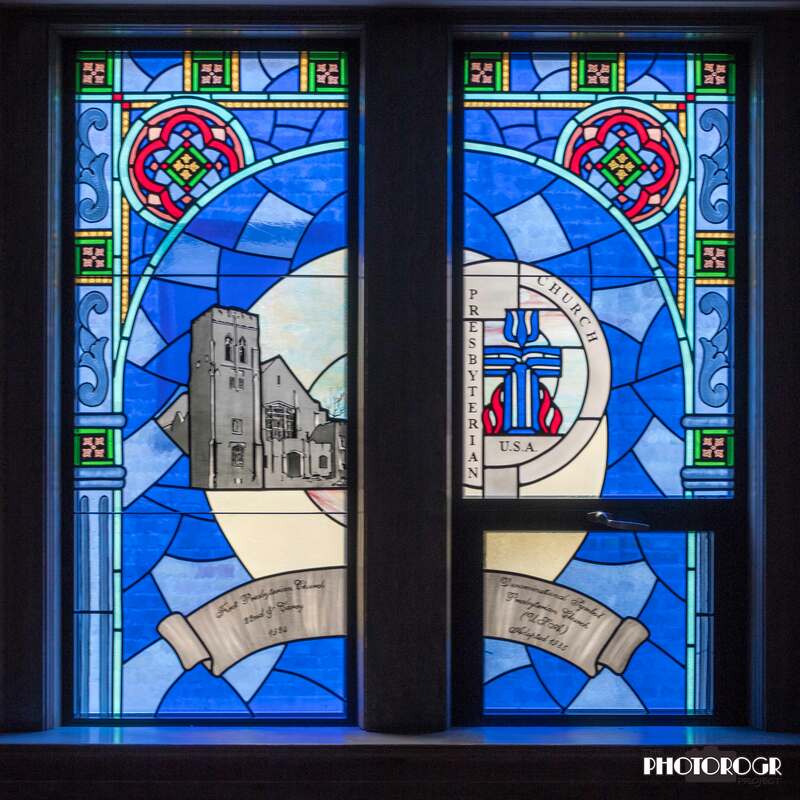 The 4th window shows the current church building at 22nd and Carey, built in 1924, and designed by church member Frederick H. Porter. The Memorial Chapel was dedicated in 1948 (my favorite room in the church), and the Education Building was dedicated in 1961. Mr. Porter served as Head Usher for many years, and taught the Boy Scouts to usher and collect the offering on Scout Sundays. The right panel shows the official seal of the church denomination, adopted by the General Assembly in 1985. I hope you have an idea of why I love this building, and are enjoying my photographic exploration of the stained glass windows. 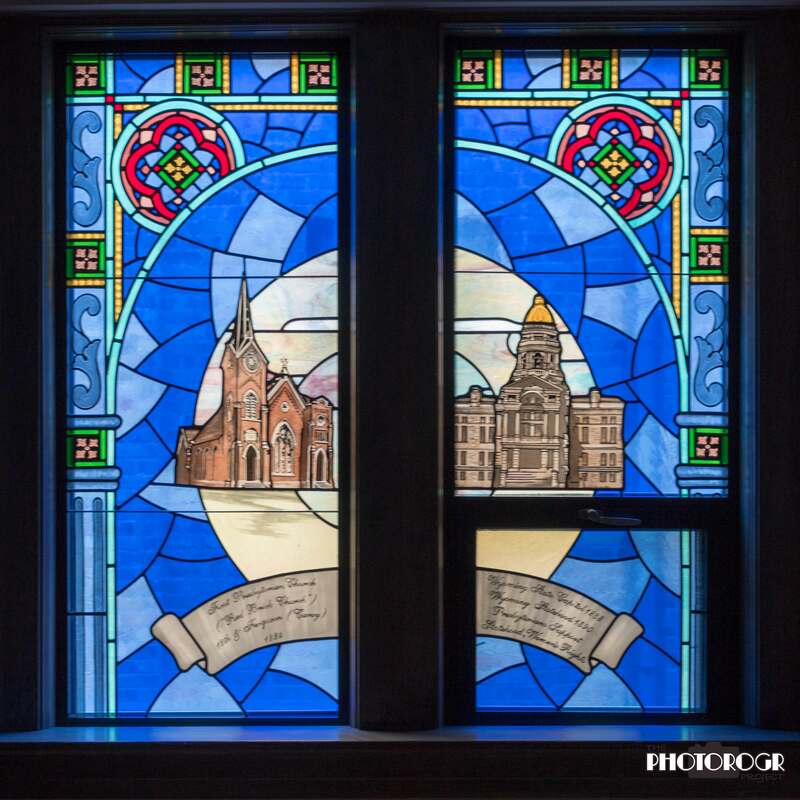 All information about the windows comes from the Church’s well written and informative book about these beautiful windows.